Quick and easy one pot chicken and rice recipe, made with simple ingredients on stovetop. It’s is a healthy 30 minute meal, packed with Cajun seasoning, peppers, corn. Among the many chicken and rice recipes I make, my family says this one pot chicken and rice recipe is their absolute favorite. I never ever have any leftovers! It’s just as good as this One Pot Sausage and Rice. It does have a little bit of spicy kick to it because of the Cajun seasoning but that can be easily adjusted, based on how much spice you can handle. 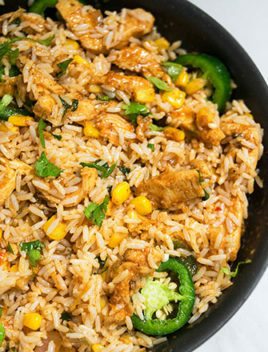 Leftovers of this chicken and rice one pot meal make a great lunch the next day. Chicken and rice casserole is different than one pot chicken and rice recipe. Some people confuse the two recipes but they are both entirely different. The casserole is made in the oven unlike my version which is made on the stovetop. Add chicken, ginger, garlic and cook for a few minutes. Add broth, spices, peppers, rice, corn. Cover and cook until rice is cooked. Mix in cilantro and you are done. Prepare the meal, as per the instructions below. Then, dump it in a casserole dish and sprinkle lots of cheese and breadcrumbs on top and broil on high for 10 minutes until cheese is bubbly and fully melted. When the rice is fully cooked, add 1 cup of cheddar, mozzarella and/or parmesan cheese and mix it into the rice. One Pot Chicken Thighs and Rice– Use chicken 4 or 5 chicken thighs instead of chicken breast pieces. Chicken Breast and Rice– Use whole boneless chicken breasts, strips or cubes. 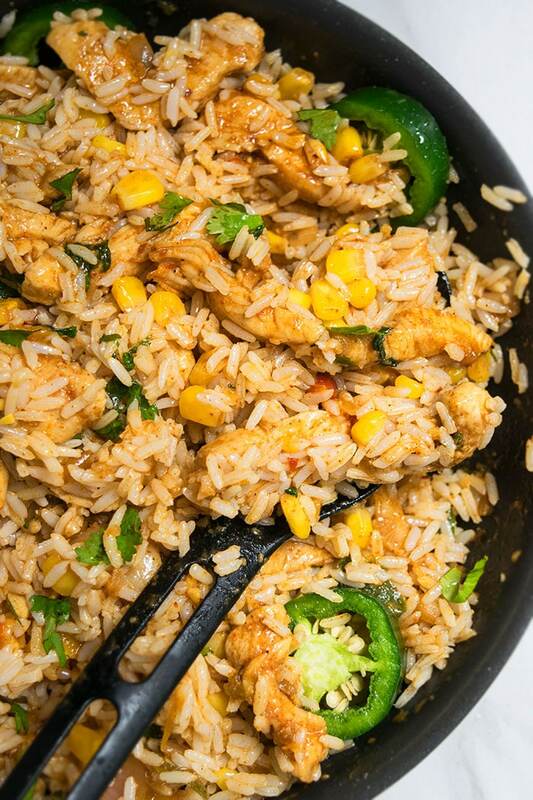 Fried Chicken and Rice– Stir fry the leftovers the next day (stale rice works best in stir fries) in some oil in a wok. Creamy Chicken and Rice– Lower the amount of heavy cream and balance it with some heavy cream or half and half or even cream cheese. 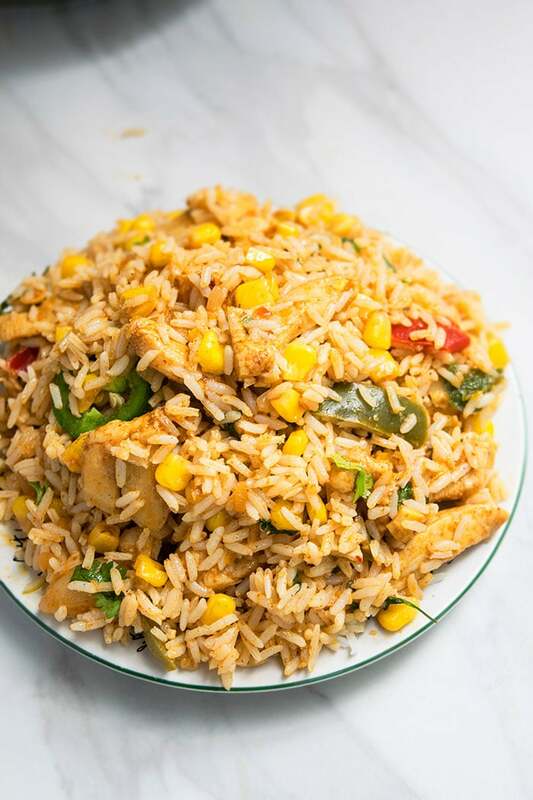 Chicken and Brown Rice– Replace regular rice with brown rice but the cooking time will need to be increased since brown rice takes longer to get cooked. Chicken and Rice soup/ Chicken and Wild Rice Soup– Add more broth and water to create a soup-like consistency. Also, increase the quantity of cajun seasoning. Also, use wild rice instead of regular rice. 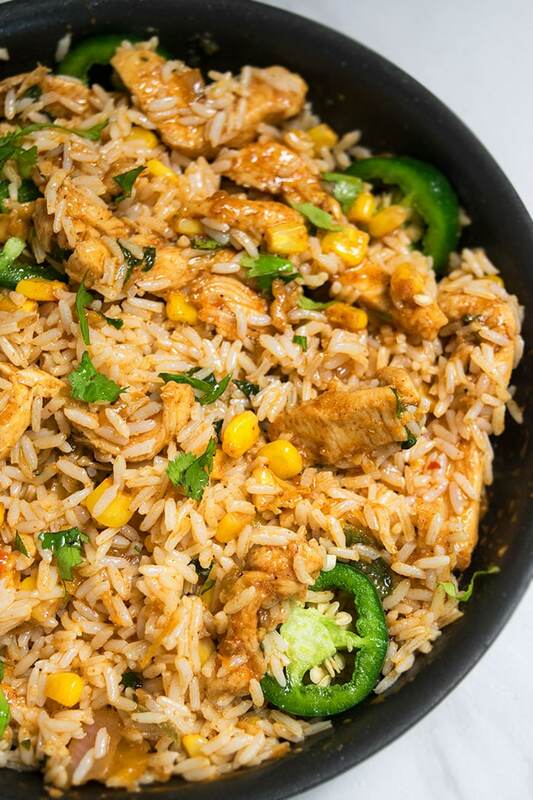 Mexican Chicken and Rice– Use taco seasoning instead of cajun seasoning. Chicken Rice and Beans– Add 1/3 cup canned beans in this recipe. Chicken and Rice Recipe with Cream of Mushroom Soup– Add 1 small can of cream of mushroom soup in this recipe and reduce the amount of brother by 1/4 cup. The rice you use in this recipe must be uncooked because if you used cooked rice, they will become soggy and kind of like a mushy paste. Adjust the amount of Cajun seasoning, based on your preference. Any seasoning of your choice can be replaced with Cajun seasoning- Italian, Mexican, Indian curry e.t.c. Cilantro really takes this meal over the top because it adds a wonderful flavor and aroma. Don’t omit it! Use low sodium broth to prevent the meal from becoming too salty. Chicken broth can be replaced with vegetable broth. Don’t use beef broth because the flavor wasn’t too good. Quick and easy one pot chicken and rice recipe, made with simple ingredients on stovetop. It's is a healthy 30 minute meal, packed with Cajun seasoning, peppers, corn. Heat oil in a nonstick pot over medium high heat. Add onion and cook until slightly soft and translucent. Add ginger, garlic, chicken and cook until chicken is golden brown. Add broth, Cajun seasoning, salt, pepper, rice, green pepper, red pepper, corn and mix everything together. 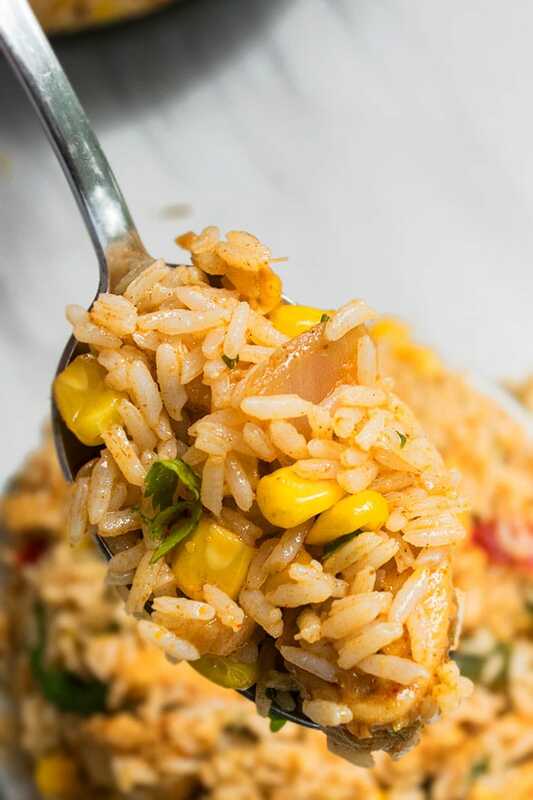 Cover and cook on medium heat for 20 to 25 minutes or until rice is fully cooked and liquid is absorbed into the rice. Sprinkle cilantro and mix again. Garnish with some sliced jalapenos, if you like, and enjoy!